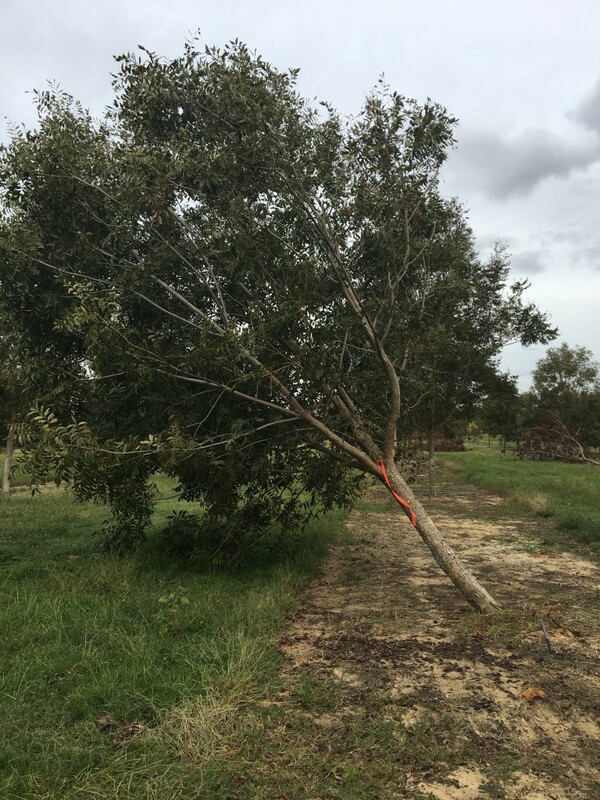 One of the most difficult assessments following damage from wind is whether or not to keep leaning trees. There are a few different rules that Dr. Wells mentions in the Southeastern Pecan Handbook. In Wilcox, we have downed trees representing many ages of pecans. This is a 7-year-old orchard of Pawnee, Sumner, Elliot and a few other cultivars hit hard. Generally, these are your downed trees. At this age, they don’t have an established root system. 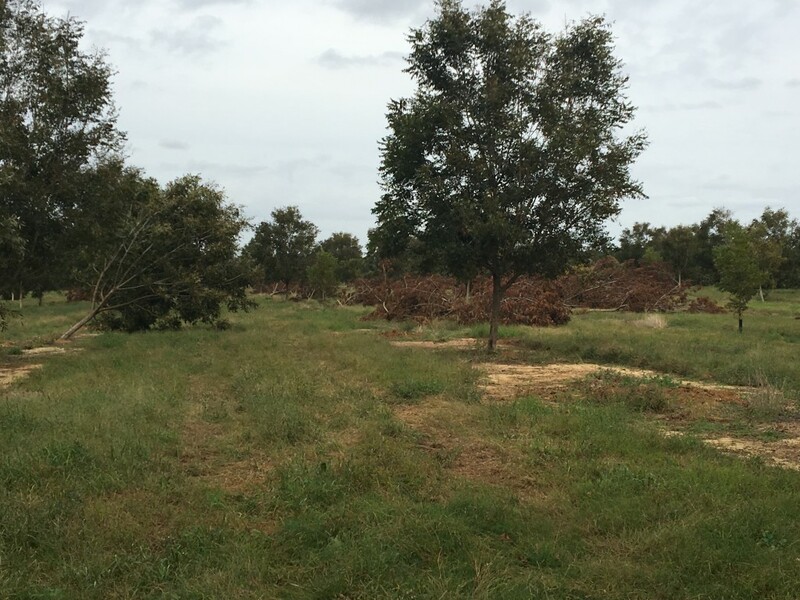 This orchard had over 1K trees down which came out to 37%. This was a terrible loss. First, we do not consider righting a tree with a larger than 15″ trunk diameter. These are best to just remove. When we talk about ‘righting’, we are mainly talking about trees in the 7 -10 or 15 year range. 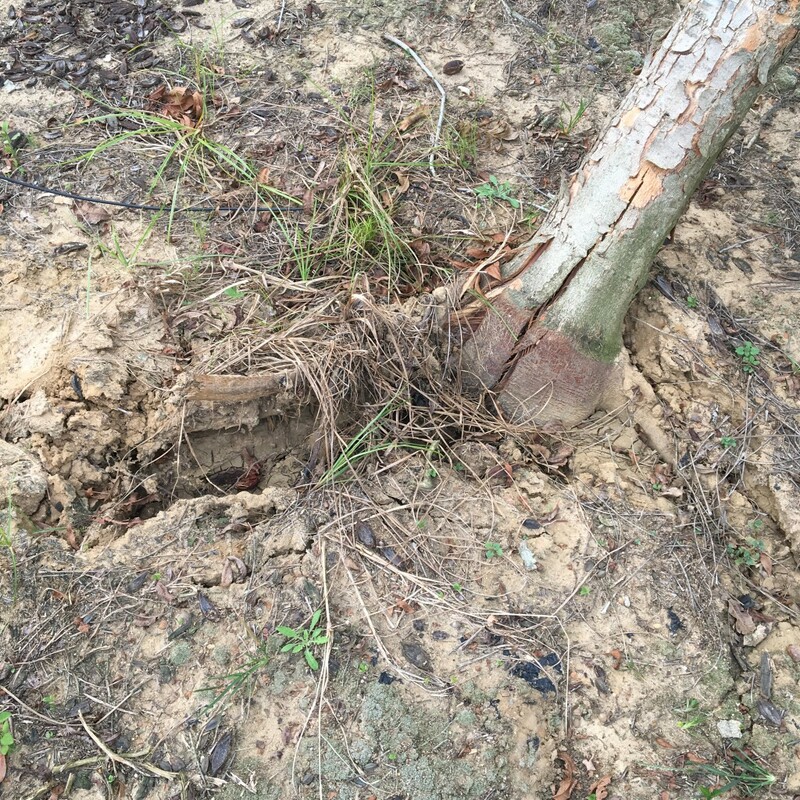 Keep in mind that leaning trees often have root damage even if roots are not pulled out of the ground. It’s really hard to know and predict the future performance of based on lean angle. They looked at trees after hurricane Frediric in 1979 and see that trees > 45 degree angle remained productive for 25+ years without righting. But many small trees with less lean angle died after a few years. 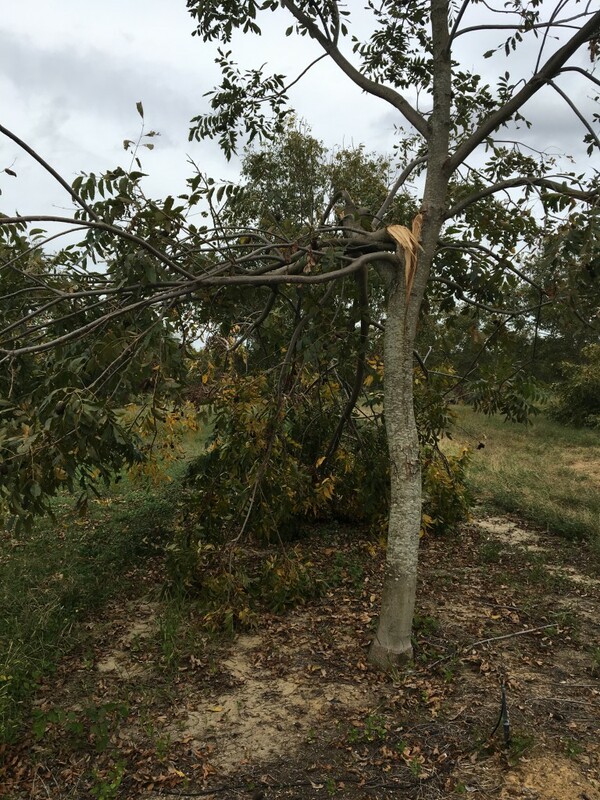 A pecan tree with a 20 degree lean and no roots showing from the surface of the ground STILL can and likely have root damage. Righting trees tends to work better for smaller trees (trunk < 10 inch diamameter) and done during dormancy. Trees of any age or size leaning at <20 degrees often require NO righting. These trees usually grow new roots and can right themselves. If anything, prune the canopy back to balance the root damage. Mature trees leaning at >45 degrees usually better to remove. There are more exceptions to the rule here as younger trees can be righted and perform well. The greatest uncertainty is trees within the 20 – 45 degree angle. This was the most common scenario we looked at. Should we try standing up this 45 degree angle lean? 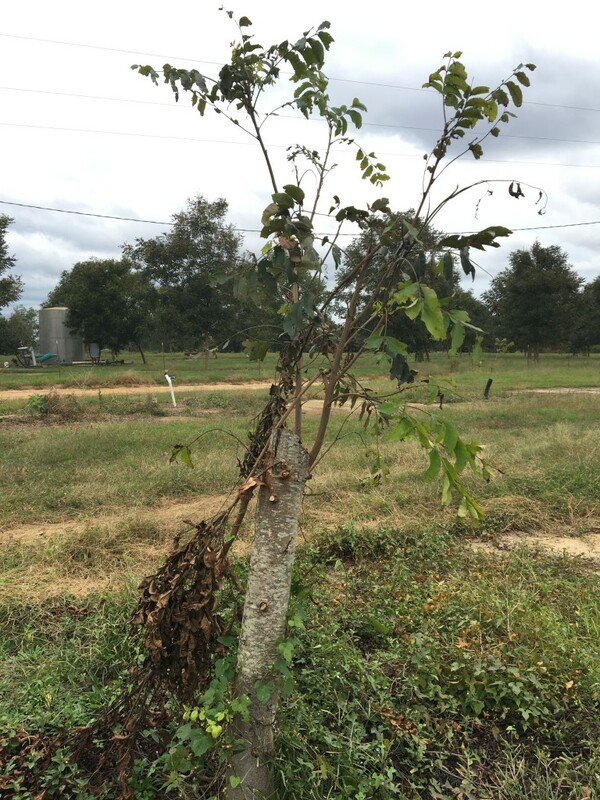 So many growers have tried this and it seems like even with 45 degree leans, the trees probably sustain enough root damage that a newly planted pecan tree can start growing and producing faster than this thing can recover. This one is coming down. Another thing to look for is roots pulled up. When you can see the soil line and roots, there is probably strong root damage. This is something I haven’t seen in pecans. You can see what looked like straight line winds through this orchard, where trees were down in a line. Rediculous. On the outside was a few trees that were split in the trunk. This is likely not going to turn out good. Dr. Wells discussed one of the options being to cut it back and let it restart growing. This is hard to do because you have to manage those dominant branches and try to keep them from breaking.